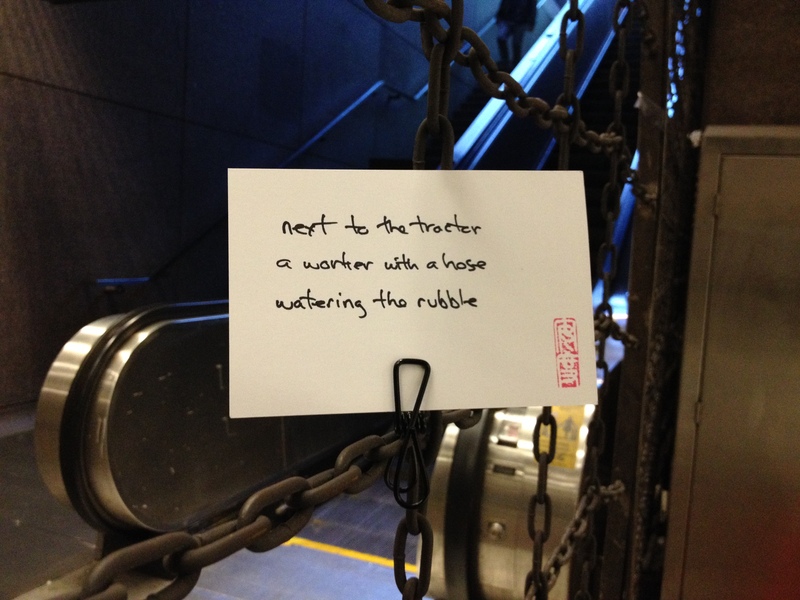 Hmmm…my wife and I discussed this one last night and weren’t sure what was going on in the haiku. Could you provide a few words about the “back story?” In any case this one wins the prize for being both interesting and enigmatic. Way to go! This might need a real photo to go with it. I work in downtown San Francisco. As part of a massive project that includes a new transit terminal and numerous skyscrapers, many of the older buildings surrounding our newer building are being demolished one by one even as new construction begins on the cleared lots. One common feature is the tractor/shovel/dozer pushing rubble around along with a guy in a hardhat hosing the rubble down (presumably to reduce dust). The motion is identical to someone watering a garden, so I guess I was going for that.